As a relatively new Cohousing Woodside member, I jumped at the opportunity to attend an Open afternoon at Spring Hill Cohousing in Stroud, Gloucestershire. On a cold wet late autumn day, I carefully followed the route from Stroud railway station. That said, it was impossible to resist a detour into Stroud farmers’ market where stalls, dripping with rain, were already evidence of a vibrant wider community where organic food, locally produced crafts and other creative enterprises were a regular feature in the town. The tiny entry gate to Springhill itself was not a measure of the warm welcome I received as I found my way up to third floor of Springhill’s co-house. We were a small group of visitors, initially met by three residents. I had come wanting to learn more about the challenges and pleasures of being part of a cohousing community; their press cuttings and photographs not only told an intriguing story of Springhill’s development but also recorded some of the challenges of getting planning permission and of allaying the concerns of the wider community. What Springhill was sharing affirmed what I was coming to understand about Cohousing Woodside’s development to date – cohousing project evolution was neither a quick nor a straightforward process. It required patience and a willingness to be tolerant of times of huge uncertainty interspersed with a readiness to be pro-active when circumstances required. Springhill affirmed that this process can have clear and positive outcomes. 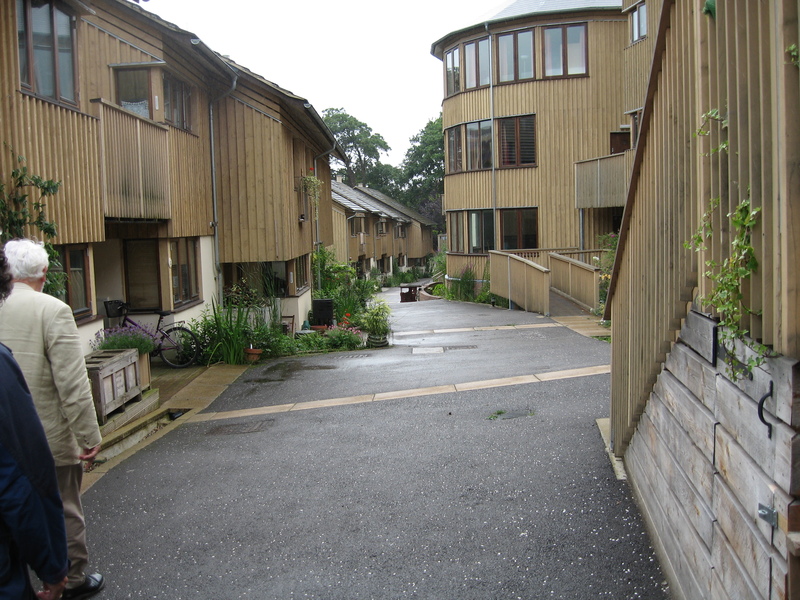 As we were treated by our guide to viewings of two houses and one flat, along with an opportunity to talk to their owners, I was inspired by how these homes were a direct representation of the cohousing ideal of providing individual dwellings within a sharing neighbourhood. Each resident had developed the design of the inside of their home in line with their own needs, interests and vision. The co-house was a hub for regular eating together and the commitment to contribute to cooking once a month, as part of the opportunity to share an evening meal three times a week, seemed a well-established and welcome part of shared community living. Over tea and cakes at the end of the afternoon – all home-made and brought to the co-house by different residents – I asked specifically about how each resident would express what they saw as one key challenge and one key pleasure of living in a cohousing community. I was then introduced to the three ‘p’s : parenting, parking and people! Living in community with other people, it was widely agreed, was the source of enormous pleasure but also, simultaneously, sometimes the source of challenge. That said, the Springhill residents I met were unequivocal in their commitment to finding the processes through which to address challenges and in their celebration of the mutual benefits of living in a Cohousing community. Their commitment was certainly infectious and I came away appreciative of the insights I had been given, and more aware of both the shared and different possibilities and challenges for Cohousing Woodside as we continue our journey towards establishing our Muswell Hill community. 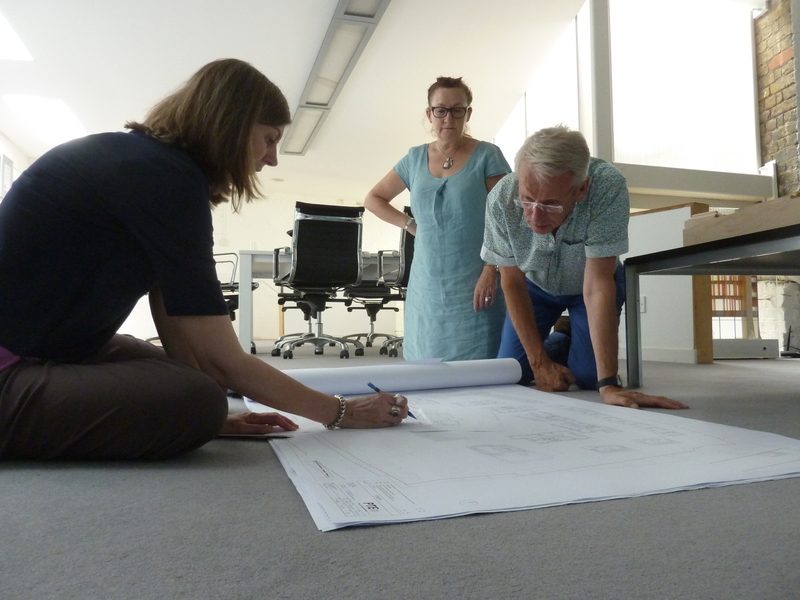 One of the rewards for taking on the early, pioneering work to establish a cohousing community is that you get the opportunity to make an input to the design of your own home. We have reached the stage where individual households are, with the help of a PTEa architect, personalising their future environments within reasonable limits. Do I want this wall there? Can I have a shower rather than a bath tub? How is the cat going to get in and out through a thick Passivhaus wall? Once the design practicalities are settled, the legal agreements signed, the real work of cohousing begins – building ourselves into a cohesive, friendly, supportive group that maintains a satisfactory balance between personal self-sufficiency and communal activities. Our group is steadily growing and individual members are gradually identifying areas of work where they may contribute their skills and experience. In the process, we are slowly getting to know each other better, which is the point of cohousing. I recently gave a presentation on this topic to a large audience of University of the Third Age members in Barnet. The North London U3A is a fast-growing group with some 1200 members and I look forward to joining them when I eventually move to North London. My theme drew on a longstanding interest in old age and ageing and a fierce determination to do what I can to challenge and change that spectrum of attitudes which ranges from well-meant paternalism to outright ageism in British society. Naturally, I offered as a powerful solution for some the example of cohousing – whether the family-based, so-called ‘inter-generational’model or senior cohousing, which is also pretty inter-generational if you think about it. A frequent refrain in my researches on Dutch senior cohousing – and one echoed by my audience in Barnet – was ‘I don’t want to grow old in the way my parents did, where they had no choices and decisions were made for them’. Planning ahead for ageing makes a lot of sense – but not very many people seem to realise this. Being very comfortable where you are is great, if you can see yourself managing equally happily there ten to twenty years on. I get the feeling from many people that their heads are firmly in the sand in relation to the latter consideration. The Danes have a saying ‘Make your choices before they are made for you’. This is wise and, although it may be a wrench now to tear yourself away from the non-age-proofed house you are living in, you may live to congratulate yourself on being so far-sighted as to move to a setting where your environment is not only built to Lifetime Homes standard (as Cohousing Woodside will be) but where you will enjoy the helpful neighbourliness you yourself have participated in building. The Community Project was built in 1999 by a group of young professionals with kids. This pioneering community in Laughton Sussex is still thriving today. Melanie is one of its founding members. If you wish to attend please e-mail info@cohousingwoodside.co.uk, before Dec 14th, so that we can organize our meeting space accordingly. Looking forward to welcoming you all to Haringey. There is plenty of free on-street parking on a Sunday. For those interested in getting cohousing off the ground this is a must. This free event will be run in several UK regions, including London (Fri 29 November 2103). A joint initiative from the UK Cohousing Network, Locality and the National Community Land Trust Network, the day-long workshop offers case-studies from around the country, expert master-classes on governance, legal issues, planning and land acquisition, partnerships, funding and finance and the different community-led housing models.